Now the first thing I should make very clear is that as we are a Nintendo switch review site, this was the platform that I played the game on and as with all reviews I primarily play the game in the handheld mode as this is generally the method of playing that is most likely to bring about issues. 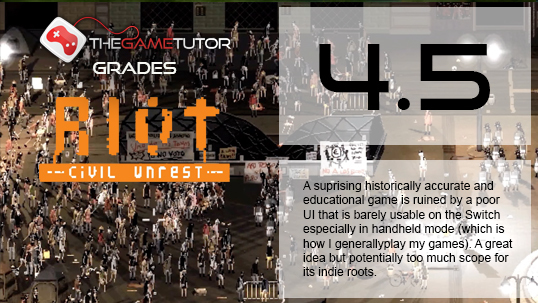 Riot civil unrest is a real-time strategy game that depicts genuine riots from history and handles them with a surprising amount of detail, care and respect. All of the scenarios can be played as police or rioters and within this you can control the movements of smaller groups. Visually the game is very impressive. With a strong pixel art style that gets across the scale of conflict and herein lies one of RIOT: Civil Unrest’s biggest issues and that is the UI. Firstly when trying to play the game in handheld mode everything is very small, and it makes seeing what is happening rather difficult. The lack of touchscreen support is baffling and further goes to make this port of the game seem like a missed opportunity. The game starts with basically no to you tomorrow and while there is one hidden away within the menu it really would have been useful for this to be presented to me at the start of the game. Whenever you start a level, you can choose whether to be police or rioters, and the two sides do play a little bit differently. The police is a little more like a traditional RTS with different types of units such as ballistics, tactical and assault. The rioters, on the other hand, is a little bit more like playing Dawn of War where you choose one key writer who will essentially lead your group and have some other skills such as using specific weapons. It's not a real-time strategy in the sense of Command and Conquer it's more the case of you suggest what the units are going to do, and they sometimes do it if you are lucky. You don't have Direct control of what happens with your unitsIn fact for people who have played the Total War series this will feel quite at home. Another slight problem is the hallway that the game works in that all levels are determined by military and politics and these often contradict one another. on a few occasions I clearly had lost the level but still managed to win due to a technicality with loss of politics points. All being said there are some things to like in riot civil unrest and if you go into it looking for something slightly educational with a light element of gameplay you might find something enjoyable here but sadly the frustration of trying to battle with the inconsistent and incredibly small you are coupled with the inconsistent gameplay made this one I would find difficult to recommend. 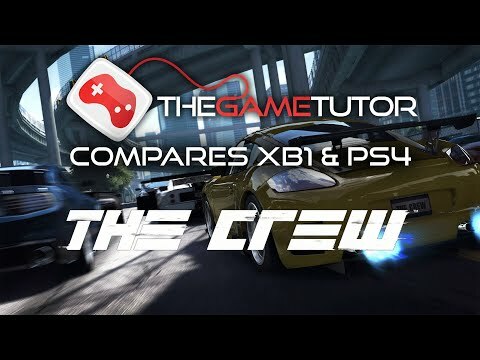 The Game Tutor compares the Graphics between the PS4 and XBox One Versions of Ubisoft's The Crew.